I've had a pretty nice weekend, but no pictures to show except for a food one. 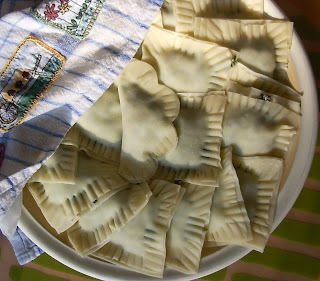 This morning I made spinach ravioli with won ton wrappers. For the filling, I cooked spinach and squeezed all the water out of it, then I added ricoota cheese, a little parmesan, flax meal, cracker crumbs, salt and nutmeg. Stir it all together and drop by teaspoonful onto the wrappers. I cut each won ton into 4 small squares and using my finger I put water around the edges to help it stick. Then I used a fork to press the two layers together. Notice the one odd scalloped one? I started cutting out with a large cookie cutter but soon decided I was wasting too much and it would take forever! They take about 2 minutes to cook in simmering water. I made a garlic, mushroom, and tomatoe sauce, but you could also do it with a pesto sauce. I have enough left over for a lunch for both my husband and I, and I froze another dinner's worth. 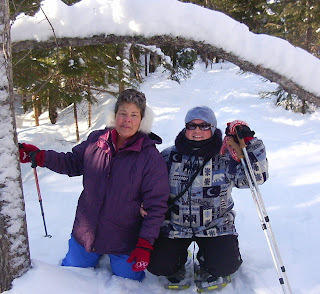 Yesterday, in the frigid temps and wicked wind we decided to go for a snow shoe. We stuck to the wooded trail though, where it was sheltered and it was actually really nice. I've also been working on 2 little projects, neither of which I can show. One is for a friend's birthday and the other I plan to send for a swap. I will show the first one after my friend has gotten it on Tue. 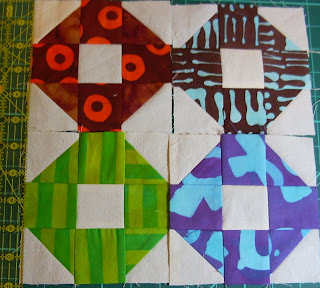 And, by the way, I did sit and take off the brown borders from the shoofly blocks. I have cut new ones to put on in the natural cotton color. Well, I have about 20 minutes before I need to go make a lunch for tomorrow, so I could sew a seam or two, but I'm sort of stuck. I've finished the 5 inch shoo fly blocks for my pillow (at least I decided it would be a pillow). Then I started to put on chocolate brown borders in order to bring it to the size I want. I'm just not sure about the brown. I really like the bright fabrics, but I'm thinking I should just use the same muslin to keep it light. I would appreciate some opinions on this. Do you ever go through phases when you have favorite color combinations? I think everyone must. Often people try to tell that you can't put certain colors together; I think those are non-artists who perhaps aren't faialiar with the color wheel and all its possibilities. Also, I don't think they've spent much time observing nature. My latest color craze is pictured below. It stems from my fascination with birds and my love of chicadees. I want to call it chicadee because it reminds me of them. This is what I wore to work today. The necklace was done by a New Brunswick jewellery designer, Trudy Gallagher. She has a store is Fredericton called Bejewel. How does one find time to sew after that???? 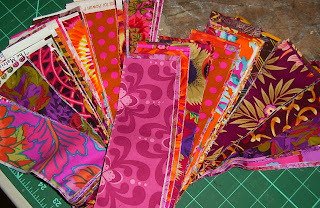 It's a collection of 2 1/2" strips by Kaffe Fassett. I'm very excited as it's not something I can find around here. They'll be lots of daydreaming about what to do with it. 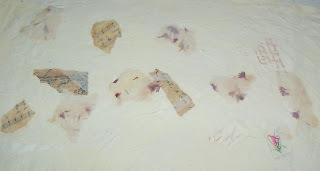 The next photo is of a piece of paper cloth that I tried last week. It's not how I expected it to look, but I guess that's part of the process. I really wanted a more chocolaty brown. I find it's a little muddy looking. I'll play with it anyway to see what I can come up with. I'm planning on using a piece for a postcard exchange so I won't picture it any further until the exchange is done-- that's if I use it. The silver is done with Shiva Paintstick before adding the paint. 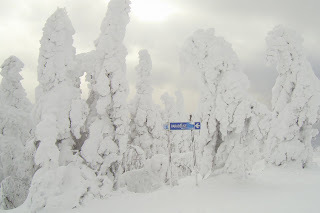 Today, my husband and I went with friends to their camp for a snowshoe hike and dinner. It was the most perfect winter day--not a cloud in the sky and no w ind in the woods. We hiked for about 2 hours up hill and down and then we had a lunch of fish cakes and fiddle heads, which we had actually picked there along the river last spring. Of course we picked up a butterscotch pie from the bakery and we ate the whole thing. Here are the 'boys' waiting for us. This is my friend, Anne, and I squatting under an arched tree. There were lots down after the last big wind storm. My intention now, is to go have a soak and then do a little sewing. 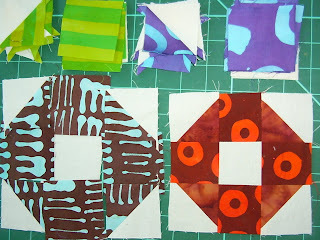 I did cut 2 more blocks for my little pillow so that it will be rectangular. If I can stay awake long enough after the soak I might put it together. 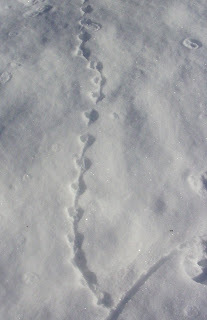 I couldn't resist this one last picture of some mouse or mole tracks; they amused me because they looked just like a string of little hearts. 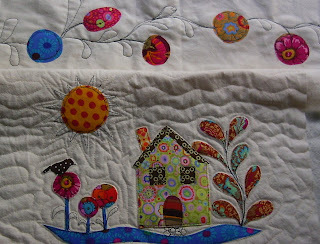 I have snippets of time to sew only snippets of fabric, but that's life isn't it? 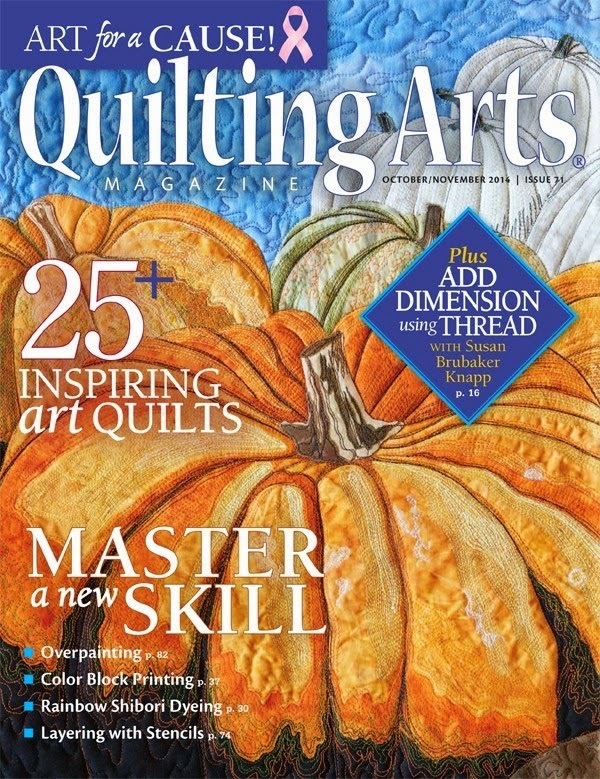 Art, sewing, and crafts, are a necessity to me, but as I've said before it is the process, not the finished product. I love to be in the moment and creating - if I get 20 minutes, a half hour or an hour, then I'm happy. To-night, even though I was tired, I managed to pack a lunch for my husband (he's had to work the last couple nights), clean the kitchen, and do a load of wash. Then I came into my sewing room, put the I Pod on and finished 2 more little blocks. I thought I might make a pillow, but may change my mind. I'm thinking on it. I'm open to some ideas. 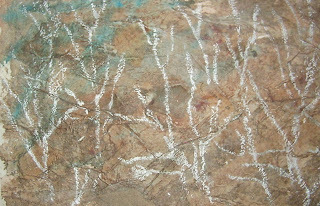 All day today I was thinking of my paper cloth and how I might paint it, so I headed to my drawing table to put a coat of brown on it after I drew on some tree shapes with a silver paintstick. I'm not sure how that's going to turn out, and I didn't take a picture since it's still wet. 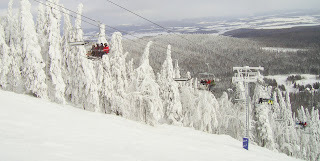 I finally was feeling well enough to get away for a day of skiing yesterday. Today turned out to be the better day weather wise, but one can never be sure, and we were ready to go yesterday. There were snow squalls at Amqui for most of the day, so there was about 6 inches of fresh snow. This would be heavenly for some- my husband, for example- for me though, it's difficult. It was lovely to get out though. I was struck but the irony of this sign on one of the trails. It says Paradise in French. Oh my aching joints! It kept me awake off and on in the night and I awoke early. I was too stubborn to take anything for my pain. The good side of it was that I had more time to relax and do some sewing. Around noon I went to visit a quilting friend where I cut the pieces for a pillow I've wanted to make ever since i got the little charm pack that I ordered from Malka Dubrawsky before Christmas. then I was so excited that I came home and out one of the blocks together. They're about 5 inches square and I will do four for the pillow. As if that wasn't enough- amazing what a little pain will do for you- I even went to my drawing table and made a piece of paper cloth following the directions of Kelly Perkins in her book Stitch Alchemy. I bought that before Christmas too and just haven't had the time to try it. It needs to dry now and later I will add some paint color to it. Supper is calling to me. I just took a pork tenderloin in a chutney sauce from the oven along with baked potatoes. I fell off the creative bandwagon to-night. Sometimes in the winter after work, I just feel the need for something mindless, and that's when I pull out something like my box of 1 1/2 inch squares. 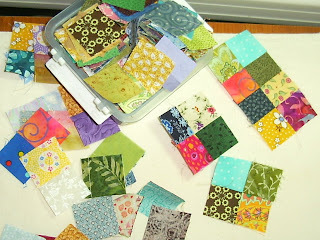 I save these from scraps left form each quilt that I have made. They will eventually be a quilt. 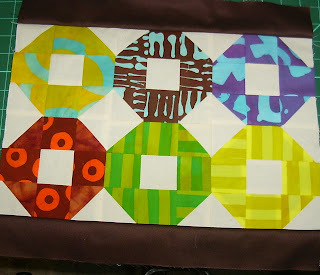 I have several squares done with star borders which I will provide pics for another time. Yesterday was the turn around day for me. Finally after 1 month the elephant got up and left. At least that's what it felt like; I had forgotten what it was like to feel normal. Last night I went back to yoga and to-night we went for a walk on the woods trail behind the school with our headlamps. There is something so magical about a winter's night in the woods. After the walk, I had my soak, put on the soundtrack from the Hobbit which I haven't listened to in a long time, and I cut my sewing machine cover to size and sewed the top to the front. I still have to make it a little smaller, I think and quilt the back panel. 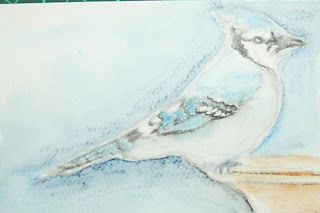 Also, I'm including a little sketchy watercolor I tried of the blue jay using the Inktense pencils that I just bought. I didn't take a very good picture I can see. What a beautiful winter day it is out there today, even though the temperature has dropped somewhat from earlier this week. Our outdoor thermostat says -8.5c right now, but the skies are blue for a change. I'm finally feeling like I'm starting to surface form my stupor; I got out for a short walk in the woods yesterday and a 40 min walk today. It was slow going, but oh so nice to get out! 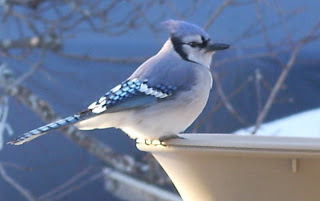 This morning I got this picture of a blue jay at our heated birdbath which is right outside my kitchen window. I love the color. Though I was home sick for a couple days this week, I didn't do much more than read and knit which really is what I was supposed to be doing after all. 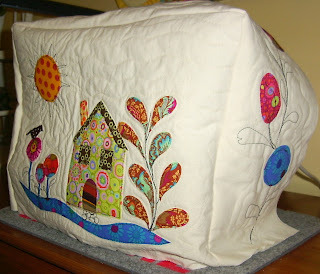 Yesterday, I put in a little time on the sewing machine cover that I started last weekend. I've quilted the front, and what you can see in the picture below also has the section that will run across the top and down the sides. It is the section at the top of the photo with the garland of folky flowers. It will probably take me another weekend or so to finish, especially if I get back enough energy to go downhill skiing some weekend. It's not a race though is it? I keep reminding myself to work at my own pace. It is the process I enjoy- that's why I do it. I may do a little more today but maybe not. I want to do some yoga, and I may take some time after dinner to-night to play some Wii with my husband. I barely got in 2 days of work this week and the doctor put me off for a couple days. I really was happy to be back, but I just can't seem to get this bug out of my system. Anyway I've spent the last couple of days really trying to rest, so what I did was to curl up on the sofa with some copies I had made on cheap copy paper of a 'paint splotch' for a challenge on the Art from the Heart ring that I belong to. 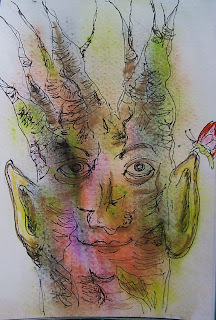 Here is what I came up with by drawing with a black pen and adding colored pencil. 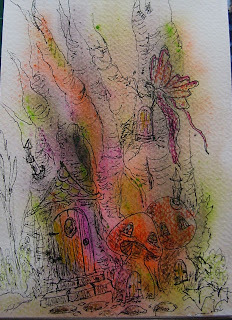 I used it as an opportunity to try some drawings from a book called How to Draw and Paint Fairyland by Linda Ravenscroft. 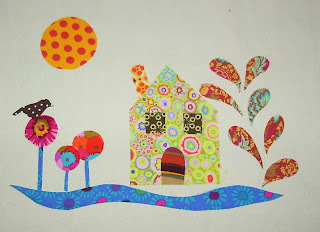 I'm thinking it would be fun to do some and mono print them onto fabric. 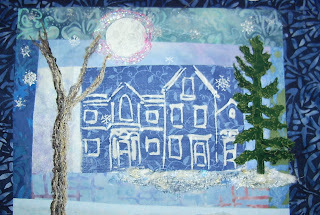 I could then using stitching and embellishing to bring out my 'found' picture. It's kind of like looking for shapes in the clouds. There's something I love about a stormy day. The house feels so cozy, and of course I can't go anywhere, so I have to spend the day playing inside! I often get the urge to make bread which I did as you can see below. It's an old recipe for porridge molasses bread that I changed just slightly by adding some mixed grains along with the oatmeal as well some whole wheat bread. We'll be having some for supper with molasses on it to go with stuffed sweet potatoes. For some time now I've been wanting to make a quilted cover for my sewing machine; I woke up thinking about it at about 5 am this morning. I made tea, grabbed my pen and notebook (kept on my night table) and sketched out my idea. What you see here will be the front. It's just a start. I've written down the measurements, though, so I could do up a pattern. 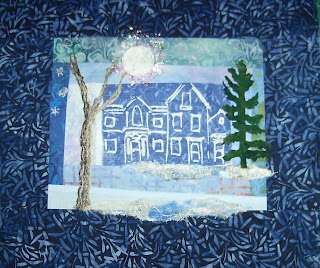 Last night while lsitening to the music on my I Pod, I started hand stitching the snowflakes to my little scene. I still have a few more to add before i sandwich it to quilt. I spent today relaxing and just being quiet. I made tea when I first woke up and read in bed for awhile. After a simple breakfast of fruit and yogurt salad and eggs, I put my little tree and my ornaments away. I was anxious to get outside since we've been away and I also haven't felt up to much. 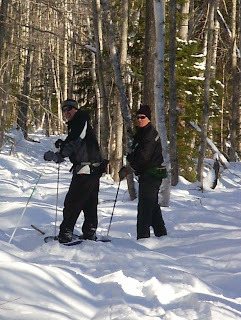 My husband G. and I went snowshoeing at a slow pace for about an hour. It was just the right temperature; I always where a mask with mesh over my mouth for my breathing. It was so peaceful; I really needed it. Nature is my spiritual place. 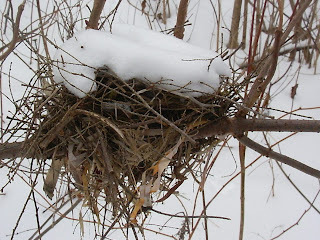 This nest was near the trail. I love the stillness here. 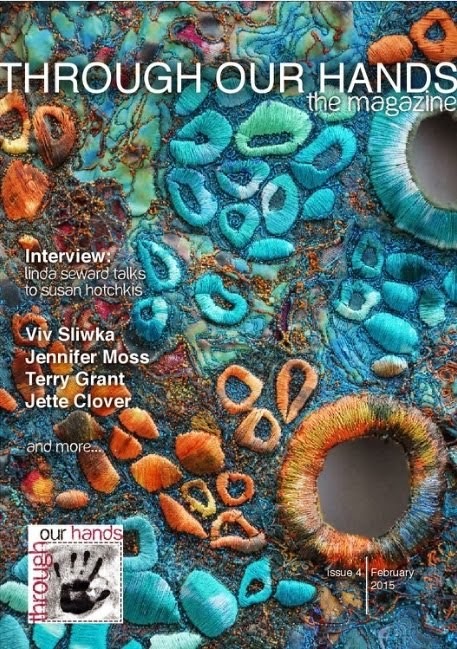 This afternoon I finally spent some time in my studio to work on this wall hanging. I added the moon and the tree on the right. You can see the pins holding some Angelina fibers around the moon as I haven't decided if I'll add them or not.